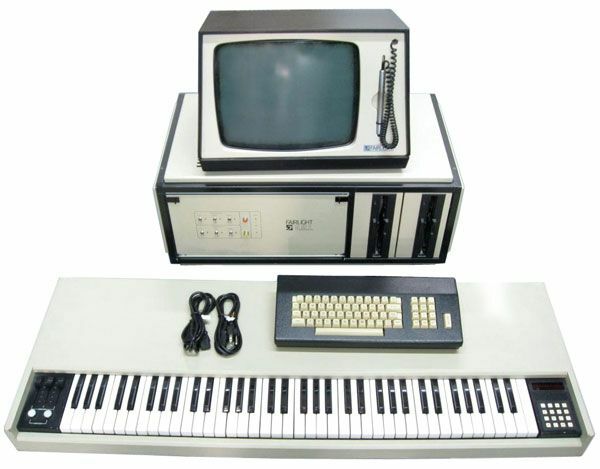 The Fairlight Computer Music Instrument (CMI) was a high-end computer based digital synthesiser, sampler and sequencer used extensively in music production throughout the 1980s. Designed in Sydney, Australia by the founders of Fairlight, Peter Vogel andKim Ryrie the CMI was based on an earlier Fairlight instrument the Qasar M8 (Multimode 8), created by Tony Furse in 1975 (which in turn was based on Furse’s hybrid analog/digital synthesiser, the Qasar I. in 1972). In 1979 this new concept was integrated into the successor to the Qasar M8 christened the Fairlight CMI I using the same 8-bit , 8 voices of polyphony, 6800 Motorola processors as the Qasar. The CMI I featured a 73 note keyboard, a central unit with two 8″ floppy disk players, an alphanumeric keyboard, monochrome monitor, a lightpen and ran using their proprietary QDOS operating system, a variant of the MDOS Motorola system. The original CMI also came with an £18,000 price tag. 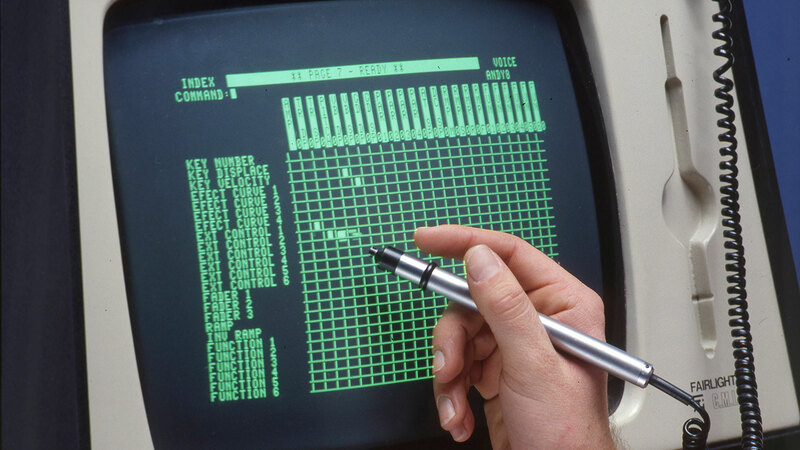 The CMI was the first instrument to include digital sampling, graphic waveform editing (via the light pen), FFT based additive synthesis and a software sequencer. Despite it’s poor 8bit/24khz sampling ability, the CMI was responsible of introducing sampling to musicians and became an immediate commercial success and became a recognisable feature in pop music throughout the 1980s by artists such as Peter Gabriel (who started Syco Systems the first company to import and distribute Fairlight In Europe), Kate Bush, Geoff Downes, Trevor Horn, Alan Parsons, Rick Wright, Thomas Dolby, Stewart Copland, J.J. Jeczalik (Art of Noise), Mike Oldfield, Stevie Wonder, Herbie Hancock, Jan Hammer, Joni Mitchell, Jean-Michel Jarre and many others. In 1982 Fairlight upgraded the CMI I to the CMI II and IIx, still with an 8 bit rate but increased to 32khz. The big change being the addition of the Page ‘R’ graphic software sequencer – a time-line based score editor that allowed composers to easily copy and paste bars, patterns and songs. This innovation became the prototype for almost all software sequencers developed after the 1980s. the IIx was based on dual 6809 processors with the addition of a MIDI/SMPTE interface. The series II sold for £27,000 . The final CMI, the series III, was released in 1985 and featured a 16bit, 50khz 16 voice stereo sampling capability (100 kHz in mono). The CMI III ran on the new OS9 and included a hard drive and graphic tablet and updated Page ‘R’ called CAPS (Composer, Arranger, Performer, Sequencer). The series III CMI was considered state-of-the art technology at the time and sold for £60,000. Similar to many other innovative instrument designs, the Fairlight CMI became a victim of it’s own success. After introducing sampling technology the Fairlight CMI had to compete with new instruments such as the Akai S612,S900, S1000 samplers (designed by David Cockerell after leaving EMS) and the Ensoniq Mirage, sold for a fraction of the CMI’s price. The arrival of cheap and widely available components and affordable home computers killed off the market for high-end digital samplers. The Fairlight company went into recievership in 1988 but reformed in 1990 focussing on video post-production equipment.